Joy Anderson and Marilyn Dickson will lead a discussion of the Richardson Reads One Book selection, Spare Parts by Joshua Davis. Reading the book before the discussion group will be helpful to your participation. In 2004, four Latino teenagers arrived at the Marine Advanced Technology Education Robotics Competition at the University of California, Santa Barbara. They were born in Mexico but raised in Phoenix, Arizona, where they attended an underfunded public high school. No one had ever suggested to Oscar, Cristian, Luis, or Lorenzo that they might amount to much, but two inspiring science teachers had convinced these impoverished, undocumented kids from the desert who had never even seen the ocean that they should try to build an underwater robot. And build a robot they did. Their robot wasn't pretty, especially compared to those of the competition. They were going up against some of the best collegiate engineers in the country, including a team from MIT backed by a $10,000 grant from ExxonMobil. The Phoenix teenagers had scraped together less than $1,000 and built their robot out of scavenged parts. This was never a level competition yet, against all odds . . . they won! But this is just the beginning for these four, whose story became a key inspiration to the DREAMers movement. 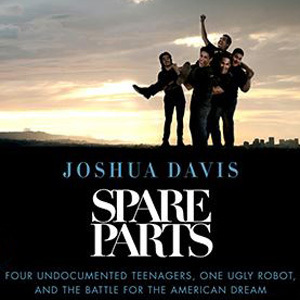 Joshua Davis's Spare Parts is a story about overcoming insurmountable odds and four young men who proved they were among the most patriotic and talented Americans in this country.